Are you searching a good article related to the structure of gametes of the human being? 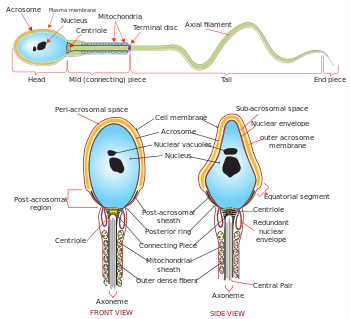 The below article will provide you with the structure of sperm and ovum. You will find the size, shape and different parts of sperm and ovum in below article. Sperm is the male gametes and ovum is the female gamete of human beings. Sperms are formed in the testes by the process of spermatogenesis and ovum is formed in the ovary by the process of oogenesis . The process of formation of sperms and ovum is known as gametogenesis. Sperm is motile, active and small whereas ovum is large in size, inactive and non-motile. Head : The head of human sperm is almost oval. Sperm contains a compact nucleus with small vacuole and acrosome over the nucleus like a cap. The acrosome is formed of the Golgi complex. Acrosome helps sperm to penetrate through the egg membrane and enter the cytoplasm by its tissue dissolving enzymes called hyaluronidases. So, acrosome is a specialized lysosome. The nucleus is generally long, narrow and pointed. The nucleus is formed by condensation of nuclear chromatin of spermatid and loss of RNA, nucleolus and acidic proteins. Chemically, it is formed of DNA and protein. Anterior half of nucleus and acrosome are covered by a fibrillar sheath called galea. Neck : Neck is the shortest segment of sperm that connects head with middle piece. The neck contains two centrioles; proximal and distal centrioles. These are introduced into the egg at the time of fertilization along with the sperm nucleus to initiate cleavage in the zygote. Middle piece : The Middle piece is also known as the body of the sperm. The middle piece consists of apical part of the axial filament surrounded by a tightly coiled spiral sheath of mitochondria. The mitochondria provide energy for sperm motility. A thin sheath of cytoplasm around the mitochondria and plasma membrane is called manchette. Tail : Tail is the longest segment of sperm, consisting of the central axial filament, thin layer of cytoplasm and an outer smooth plasma membrane. The axial filament is formed of nine pairs of longitudinal and a pair of central microtubules like the flagellum. 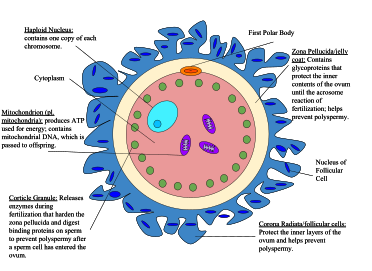 Plasmalemma : The mature egg is covered with plasma membrane or plasmalemma. Plasmalemma is made up of lipoprotein about 110 A in the thickness. Primary membrane : Besides plasmalemma, the eggs of most reptiles and certain coelenterates consist of certain other egg membranes. These membranes are known as primary and secondary membranes. The primary egg membrane is secreted around the plasma membrane by the follicle cells of the ovary of oocyte itself. In birds, amphibians, molluscs and insects, primary egg membrane is called vitelline membrane while in fishes and urochordates, it is known as chorion. In mammals, this membrane is made up of fibrous proteins and mucoproteins. Primary membrane usually remains closely adhered to the plasma membrane but in advance stages, it gets separated by perivitelline space. Secondary membranes : The secondary membranes are secreted by the wall of the oviduct and other accessory parts of reproductive organs around the primary egg membrane. Secondary egg membranes are in the form of a chitinous shell in insect eggs. In amphibians and most invertebrates, it may be composed of jellylike substance. In reptiles and birds, the egg membrane and shells are secondary membranes. The secondary membranes protect the developing embryo. So these are the structures of sperm and ovum. When sperm and ovum meet in the process of fertilization, a diploid zygote is formed which converts into the embryo. I will provide the complete process of fertilization in my next article.